The best album to bear the Bonfire stamp for some time. Should you find yourself lucky enough to release an album that everyone lauds as a classic, once the dust has settled you'll discover that it can be a bit of a double edged sword … especially if it happens fairly early on in your career. On the one hand it undoubtedly opens doors, bringing with it the much needed media focus essential in establishing your band as major players on the international scene, but the flipside is that you set yourself up for almost surefire failure by making it damn near impossible to follow. In some respects that's exactly what happened to Bonfire after unleashed the mighty 'Fire Works' back in late '87. Heralded by everyone and his dog as a near perfect slab of svelte designer pop metal; 'Fire Works' blazed a trail across the firmament that was damn near impossible to miss or resist, and to be frank the band have been playing catch up ever since. Now, that's not to say that they haven't had some great releases in the years that followed – I've plenty of time for the likes of 'Point Blank', 'Rebel Soul', 'Fuel To The Flames' and the excellent 'The Räuber' for example – but if you find yourself with a sudden Bonfire craving, chances are that you'll automatically reach for 'Fire Works' as if preprogrammed to do so. 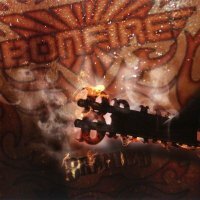 Proclaimed on the Bonfire website as their first 'regular' effort since 2006's pumping 'Double X' set – as I said earlier, 2008's admirable 'The Räuber' sounded pretty good to me as a 'regular' Bonfire album, but there ya go – 'Branded' has by default then been a long time coming. Swaggering opener 'Deadly Contradiction' kicks things off quite nicely (no, make that very nicely!) – all brooding riffs, menacing undercurrents and hypnotic harmonies – whilst following cut 'Just Follow The Rainbow' ratchets up the pace a notch or two, yet still retains the trademark strong melodies and raucous joie de vivre we've come to expect from the band. Claus Lessmann is singing ... well, just as you'd expect him to really; his warm gravel-edged vocal style continuing to add that extra passion and depth of character which has always separated Bonfire from the crowd. What really impressed me though this time around is that the Hans Ziller / Chris Limburg partnership on guitars sparkles even more so than it did on 'The Räuber', their shimmering tones once again emulating those heady, halcyon days of the late 80's. There's a nice beefy production too which further helps to accentuate this latest set of songs to their fullest. Talking of the songs … of course, the deep south influences first explored in depth on the 'Rebel Soul' opus crop up from time to time (the low slung 'Let It Grow' is excellent), as do plenty of other subtle (and not so subtle) nuances – love the lilting Eastern feel of 'Better Days' – but more and more I get the impression that they're gradually creeping inexorably back towards the coiffured sound of that aforementioned designer pop metal classic. Check out the likes of 'Save Me', the galloping 'Do Or Die', 'Close To The Edge' or the smouldering power ballad 'Hold Me Now' and share in the experience of a band gleefully rediscovering their roots. 'Fire Works Pt2'? … well not quite, but a cracking little album nevertheless, and to these ears by far the best to bear the Bonfire stamp for some time.